Uzbekistan, the turquoise of Central Asia. Let’s face it: Uzbekistan is all the rage now. 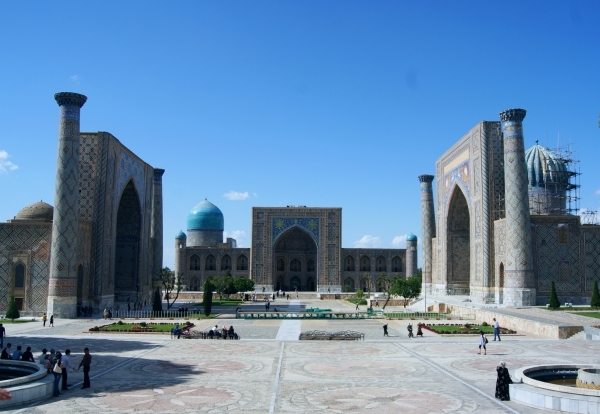 Considering the number of tourists coming there last year, more than 1 mln, Uzbekistan is a must-go destination for 2013. Let me introduce Uzbekistan. 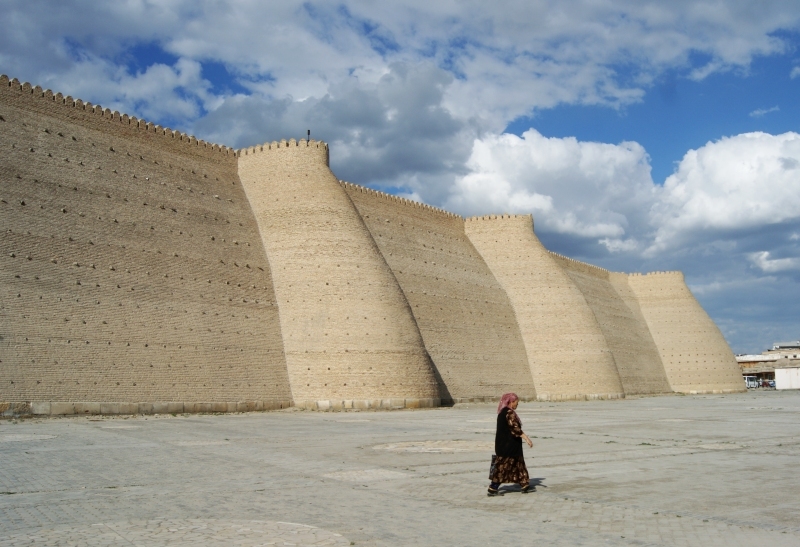 You may not have heard many things about Uzbekistan, as it is not a country often seen in the world news. Indeed, the long rule of the country’s president Islam Karymov brought Uzbek people relative peace and stability. Uzbekistan means in Uzbek the “land of self rulers ”. Uzbekistan is roughly the size of Germany. 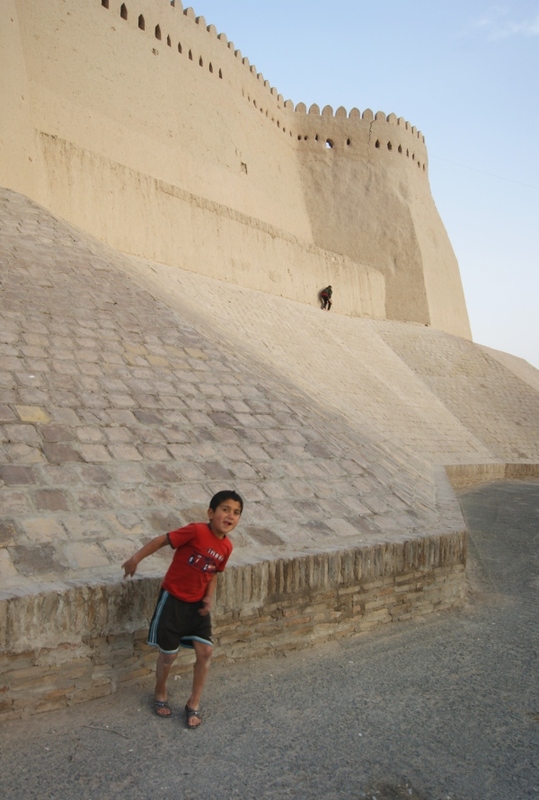 Its capital city is Tashkent, which was a powerful ancient city, but a strong earthquake in 1966 destroyed the biggest part of its antic monuments. Being part of the USSR from 1920 to 1991, Tashkent was rebuilt in the Soviet-style city model, with large avenues and high-rise housing blocks. To make things easy to remember, Uzbekistan has borders only with countries finishing with “stan”: Afghanistan, Kazakhstan, Kyrgyzstan, Tajikistan and Turkmenistan. It is the only country in the world, along with Liechtenstein, to be doubly landlocked. This means Uzbekistan has no access to the open sea, neither have its neighbour countries. Prior to my trip to Uzbekistan, when looking for basic information on the country, I have read and heard many things about Uzbekistan that have turned out to be biased. I stumble on a statement from the Council of the European Union: “The country is wealthy in natural resources, yet most of the money is distributed into the president’s ruling elite (…) Little power exists outside of the presidents family (…) The country remains as the most corrupt out of any former USSR state”. I saw it described as “an authoritarian state with limited civil rights” and “wide-scale violation of virtually all basic human rights“. It was eery! Will I end up in the sister-country of North Korea? Thankfully not! Streets were neat and clean, schools were in a perfect state, lot of shops in the streets, and people were smiling and open. When I asked about Karymov rule, they replied that despite the fact he is stuck to the power since 1991, he has the charisma to rule and give peace and stability to the country. When Uzbekistan obtained independence from USSR, there was concern that the country, long denied freedom of religious practice, would turn into Muslim fundamentalism, as it happened in some parts of the Caucasus. Free elections were organized several times, but most people simply didn’t cast their ballots as no alternative ever emerged. To Karymov credit, I must say that restoration works he had launched in all the major cities in Uzbekistan are impressive. The fact that in 2005, the government ordered the United States to leave from the air base of Karshi-Kanabad near Afghanistan, within short notice explain partly cold relationships between Uzbekistan and the West. There are of course many other reasons for Uzbekistan complicated foreign affairs. Nobody will deny the blatant corruption and nepotism there. It’s just that for a dictatorship; people were quite peaceful and talkative. Moreover, many other countries close to the EU have a much worst record in terms of human rights, but are spared by such criticisms on a large scale. The first feeling I got about Uzbekistan was the heavy smell of Uzbek migrant workers in the plane from Moscow to Urgench. Knowing that tastes can be educated, I tried to convince myself this smell was delicate and pleasant. I finally understood what the reason was for that. Uzbeks are not afraid of crowds whatsoever. At the departure gate, and at the arrival airport, they gathered together like a solid human mass, ignoring queuing rules, filling all possible inch of personal space we would find elsewhere. The second reason is that Uzbek migrant workers live in the most meager conditions in Moscow in order to send the maximum of money to sustain their family home. While the consumption society we live in is based only on self-indulgence, I felt a lot of admiration for Uzbek fortitude and self-denying. Uzbekistan definitely tries to look for its own identity in its official language. The official language in Uzbekistan is Uzbek, which belongs to the Turkic group of Central Asia. However, as many other nationalities are scattered throughout the country, you may find people speaking Tajik in Bukhara, Iranian Farsi in Khiva, Kazakh in Kyzyl-Kum desert as their first language. Official statistics tend to fiercely minimize the amount of other languages spoken in the country. 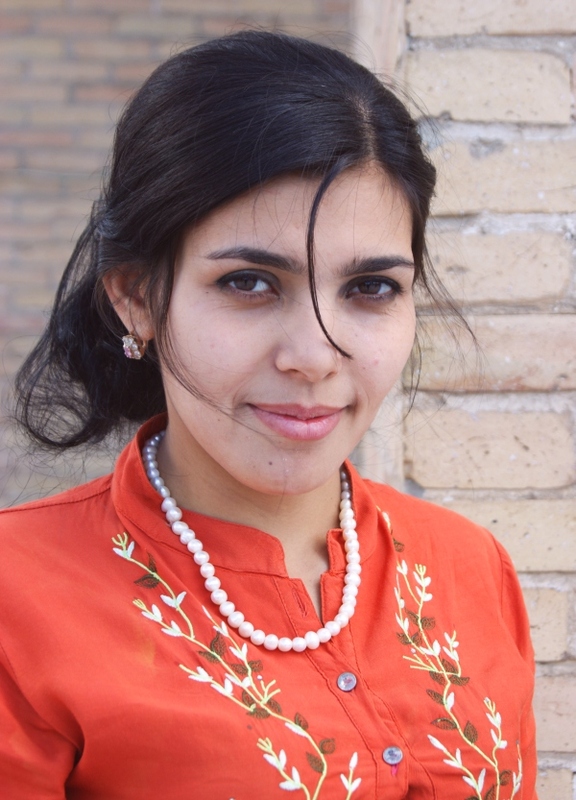 A lot of people don’t speak Uzbek at all. I saw a police officer speaking only Tajik. One day, I joined a chatter with several taxi drivers in Bukhara. They spoke between each other in Russian. I asked why they used a “foreign” language to communicate between each other. They replied that one of them was Tajik, another one Uzbek, a third Jewish. As they were all raised in the USSR, and learnt Russian from their childhood, Russian was the most appropriate language for them. Russian also offered them the rich vocabulary of swearing to express their hard working day. Russian is still spoken fluently by the majority of Uzbeks, and by all people involved in trade. Russian broadcast can be seen in all Uzbekistan cities. There are de facto no words in Uzbek for technical activities or hardware. Things like car repair, photocopy, dentist, or any technical books etc.. will be in Russian. I must mention that Uzbeks have a peculiar relationship with the Russian language. As they recall their happy childhood in the USSR, they truly love speaking with Russian travelers. I was stopped frequently in the street for a chatter, and when people knew I came from Moscow, they started to tell me how was their life in the USSR, how they served in the Red Army in Russia, and used whatever pretext to speak in Russian. In these moments, I never had the impression of being bothered by some kind of begging or selling like you can have in Egypt or India. The written language is also not yet defined. Not so long ago, Uzbek used to be written in Cyrillic, introduced by the Russians after 1940. Now, in order to cut itself from the Soviet past, the government made the Uzbek language written with Latin letters starting from 1992. The situation is that you can see various types of billboards in the street. For example, pharmacy will make: ДОРИХАНА or DORIHANA in Uzbek, or АПТЕКА in Russian. Newspapers will be mostly in Cyrillic. Car repair will be only in Russian, because it refers to technical matters, АВТОСЕРВИС or AVTOSERVIS. Nevertheless, Uzbekistan has a very high literacy rate with about 99% of adults above the age of 15 being able to read and write. 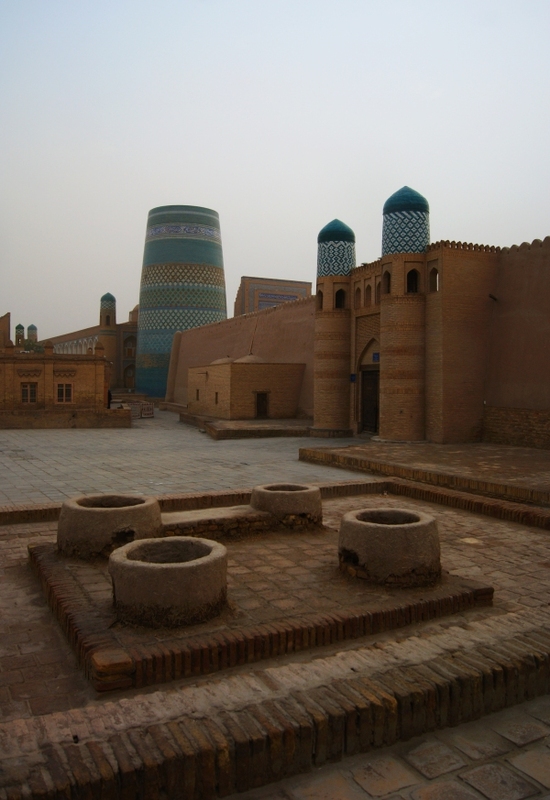 Khiva was originally an Iranian city called Khorezm before the 15th c. Khiva is the main city of the Xorazm Province, which name is reminiscent of this time. 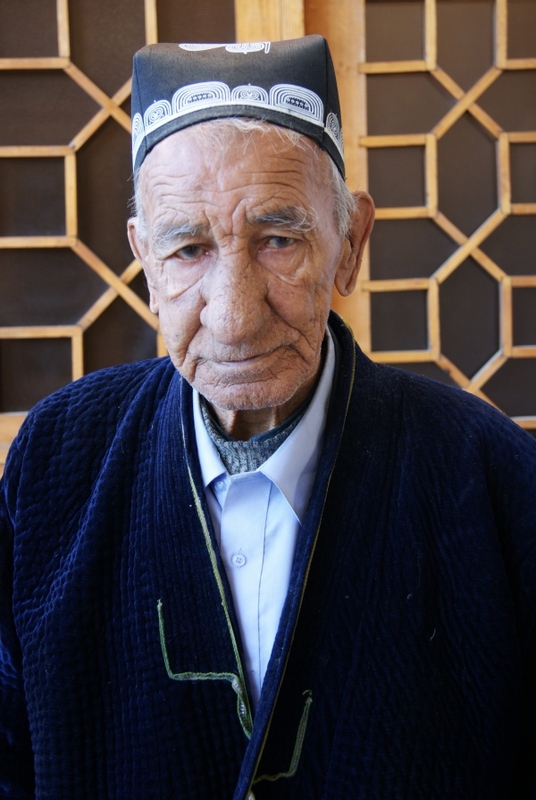 Uzbeks gradually replaced Iranians, and Khoresm was named in the Turkic pronunciation “khivarezem”, before retaining only the first part Khiva. 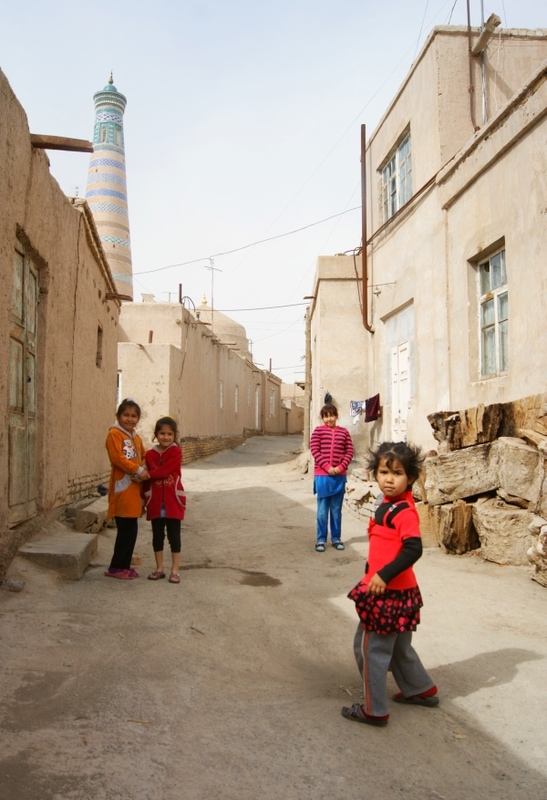 Khiva inhabitants, however, show their pride of their Iranian descent by continually refereeing to the city and their own ethnicity as Khorezm. 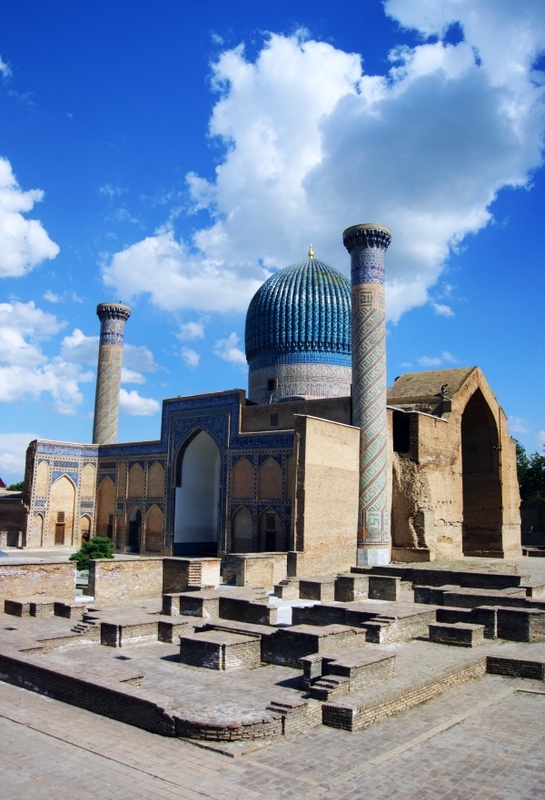 The city is also famous for being the home town of the Arab mathematician Muhamad Al- Khorezmi (783-850), whose name literally means “from Khorezm”, and gave the word algorithm. 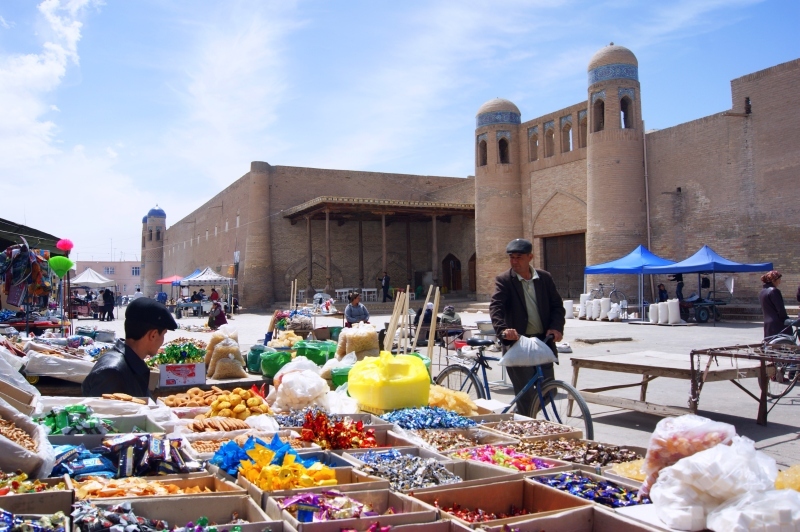 A view from the Khiva market. There is no supermarket in Uzbekistan. 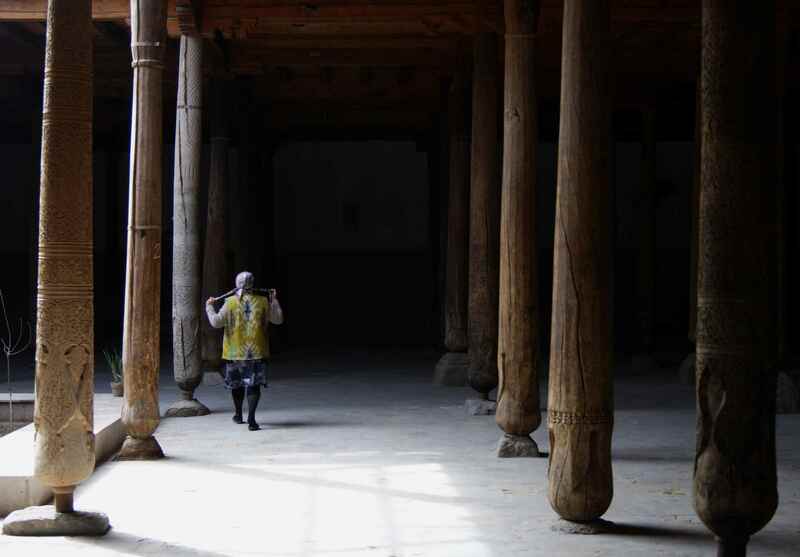 The Juma Mosque in Khiva (10-18th centuries) and its 218 wooden pillars. 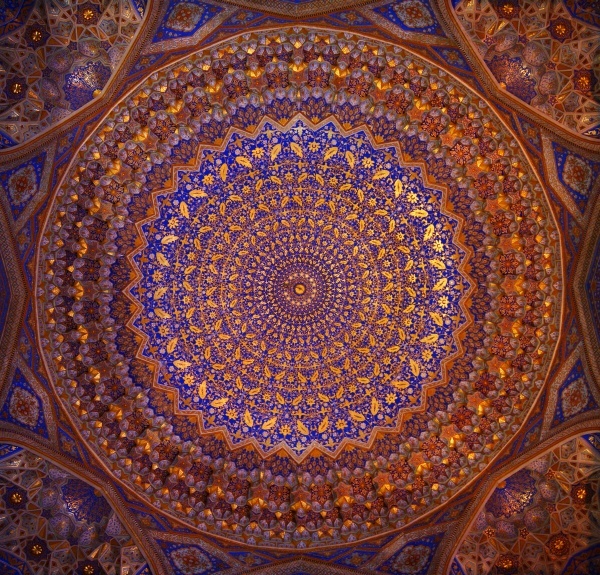 As China began to develop its silk trade with Europe, cities like Bukhara or Samarkand became powerful centres of trade on a route known as the “Silk Route”. The word “Silk Route”, however, was invented in the 20th c by the German geographer Richthofen to describe the 10,000 km way from China to Europe. It was formerly known as the “long road” or the “road of the death”. 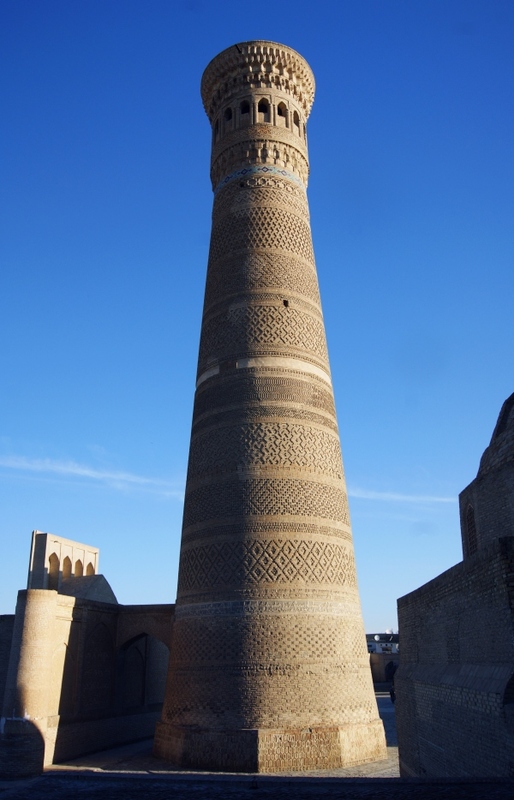 The Kalyan Minaret in Bukhara (12th century), called also the Tower of Death, because for centuries criminals were executed by being thrown off the top. 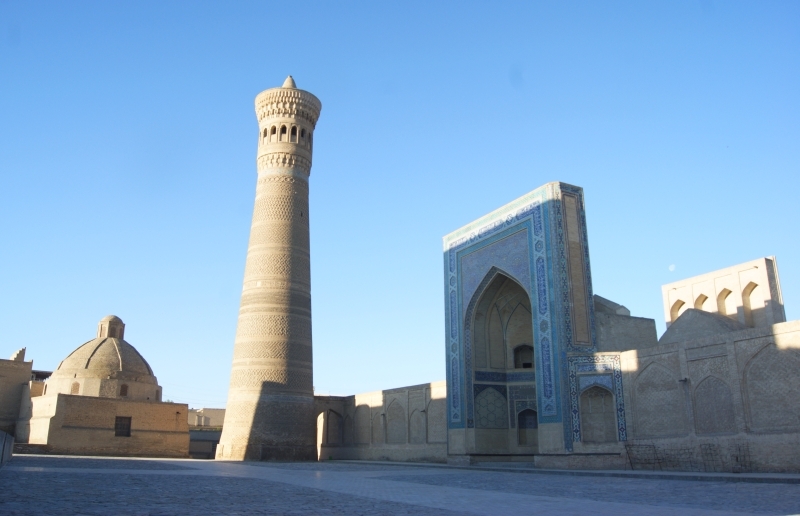 The Kalyan Mosque (16th century) and Kalyan Minaret in Bukhara. 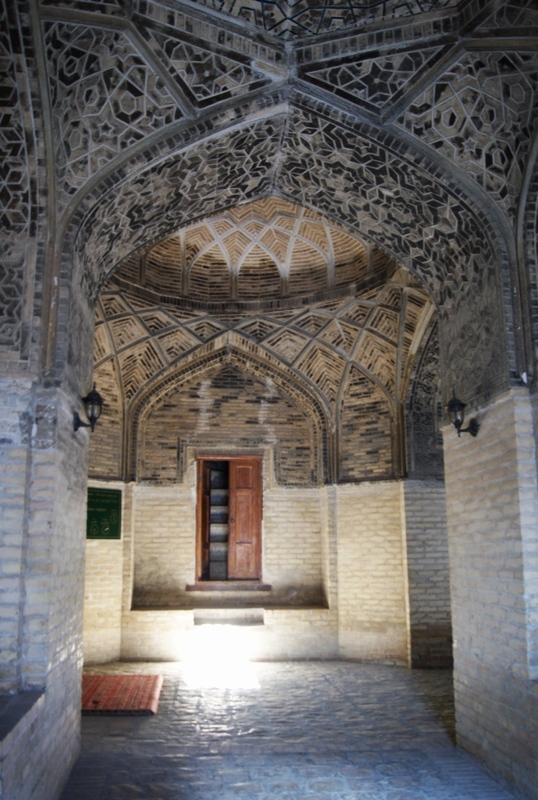 Interior of the Mir-i Arab Madrasa (16th century), still in activity, in Bukhara. The Madrasa is a sort of Islamic university. Till today, these institutions have always been free of charge, allowing every student . In many cases, you can hardly notice the difference with a mosque. A madrasa has many student’s cells in it. It has a mosque too, only it occupies a smaller space. Mir-i-Arab Madrasa used to be open even during soviet time. Ramzan Kadyrov, the head of Chechnya Republic graduated from Mir-i-Arab Madrasa. 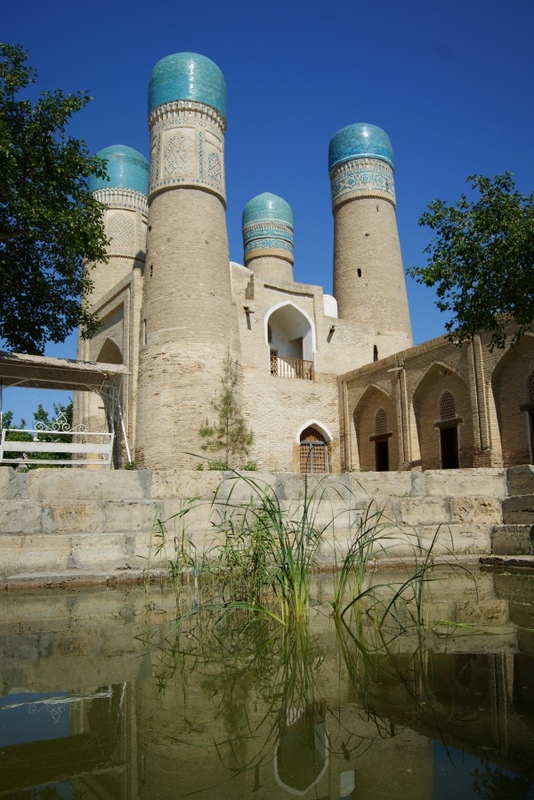 Uzbekistan main religion is Sunnite Islam (about 70%), but Islam in Uzbekistan is mainly cultural: It is prohibited to Imams to call from minaret for prayer, as it would disturb the quietness of the city. Islam was introduced by Arabs in the 8th-9th century. Despite being a Muslim nation, alcohol consumption is widely accepted in Uzbekistan. Beer, vodka and wine are produced locally. 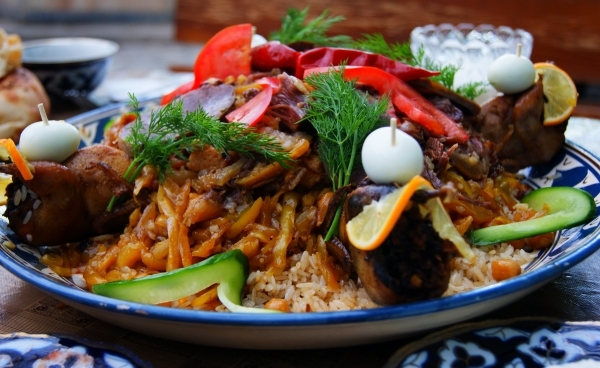 While the majority of Uzbek wines lack of balance, some Uzbek wines, such as Marvarid or Navruz are exported and have been awarded in international fairs. Public drunkenness, however, is a no-no for Uzbeks, so I’ve never had a chance of meeting a drunk man in the street. 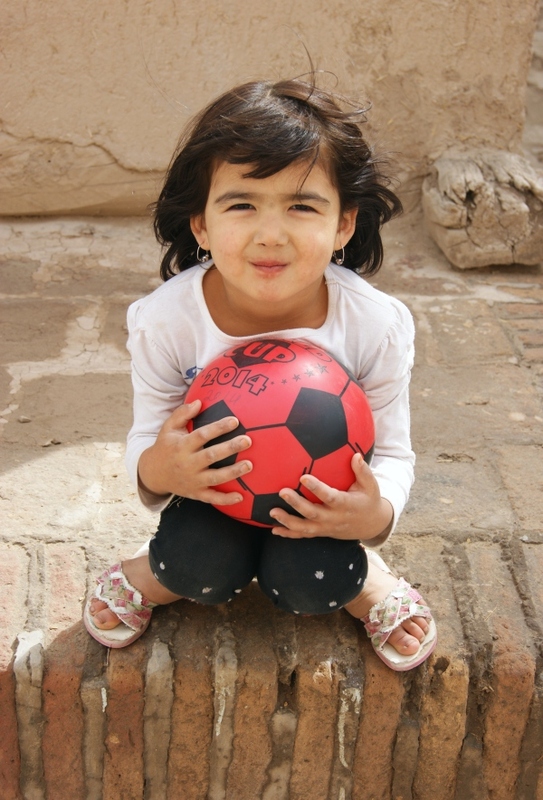 Also Islam in Uzbekistan allows young girl to dress just like they feel. Older women, however, will most certainly wear a scarf. 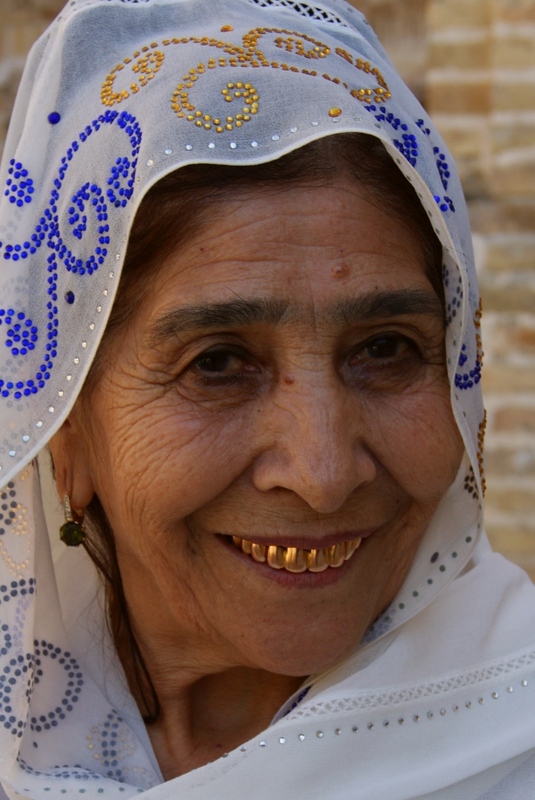 This Uzbek woman bears golden teeth, a symbol of wealth in Central Asia. Uzbekistan has the fourth largest gold deposits in the world and is among the top 10 gold producers. 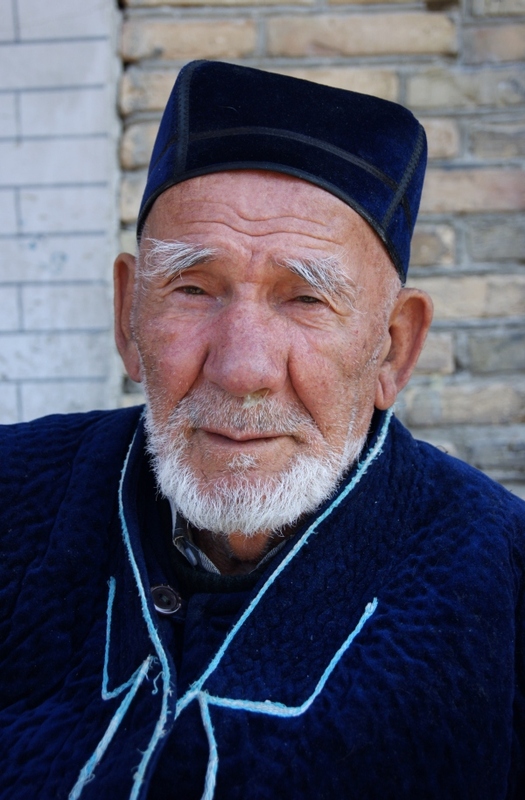 Uzbeks have genes from Iranian, Kazakh and Mongol origins, giving them these unique features. The Kyzyl-Kum desert in Uzbekistan is a dry landscape, with sand dunes and dry little bushes. From times to times, you can see a tumbleweed rolled by the wind. In springtime there is a unique phenomenon called the blooming of the desert. 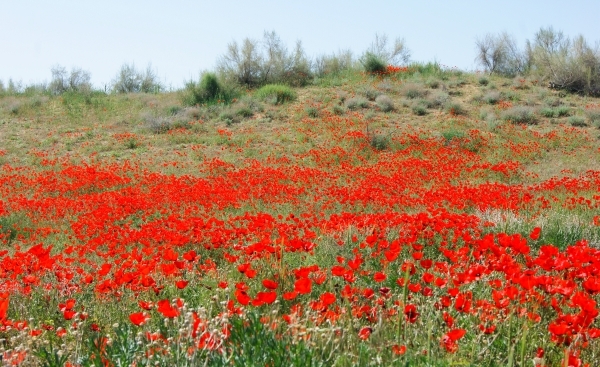 Between wintertime and the dry season, when soil is still humid, grass and poppies cover the sand, and the desert looks like a giant golf field with red flowerbeds. It is magnificent! As the weather is not so hot yet, you can walk for hours in this infinite garden. Kyzyl-Kum desert is part of the protected Nuratau-Kyzylkum Biospheric Reserve, which includes also the lakes Aydarkul and Tuzgan and the high mountain ridges of Nuratau and Koitash. 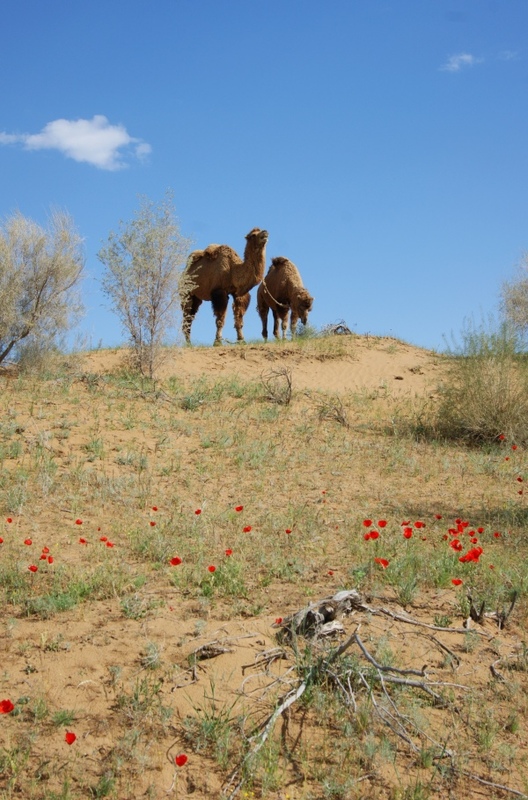 Common wildlife in the Uzbekistan desert includes birds, tortoises, yellow ground squirrels, scarabs, foxes…They are easy to spot provided you wait a few minutes. Desert inhabitants breed all kind of cattle, horses and camels. They live in huts called “yurt” made up of fabric, skin and wood. 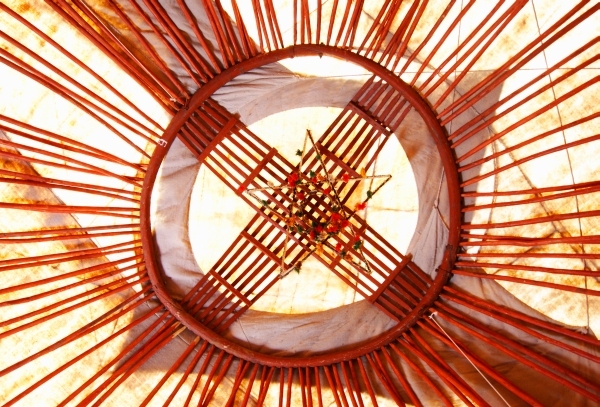 The hut ceiling is designed like a cross embedded in a circle. This pattern is represented on the flag of Uzbekistan neighbour country, Kirghizstan, which shares with Uzbekistan, Mongolia and Kazakhstan the same model of huts. 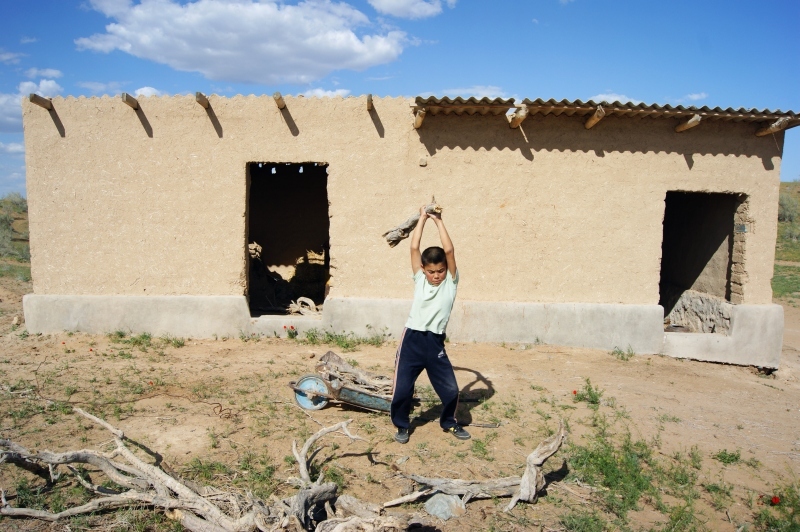 This young boy is breaking wood for cooking. The dry wood is brittle, so there is no need of an axle. 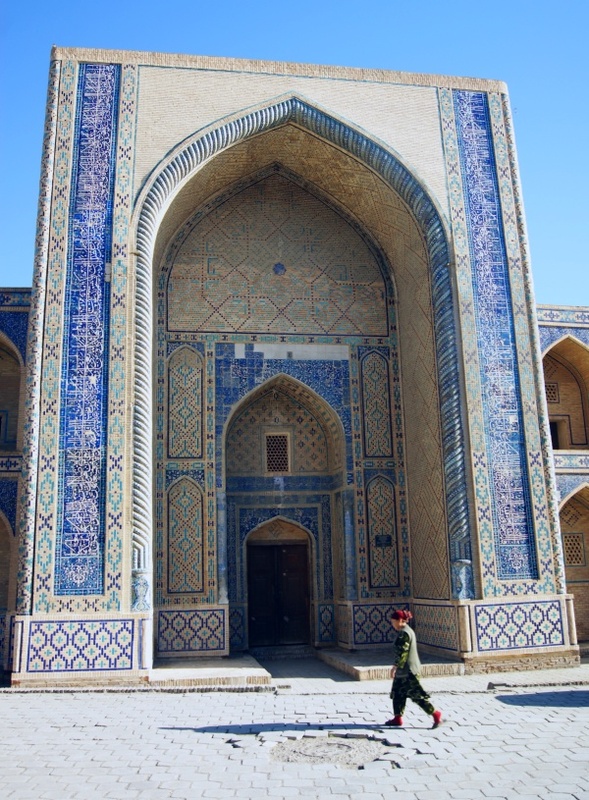 Samarkand is often rated as the most interesting city in Central Asia. 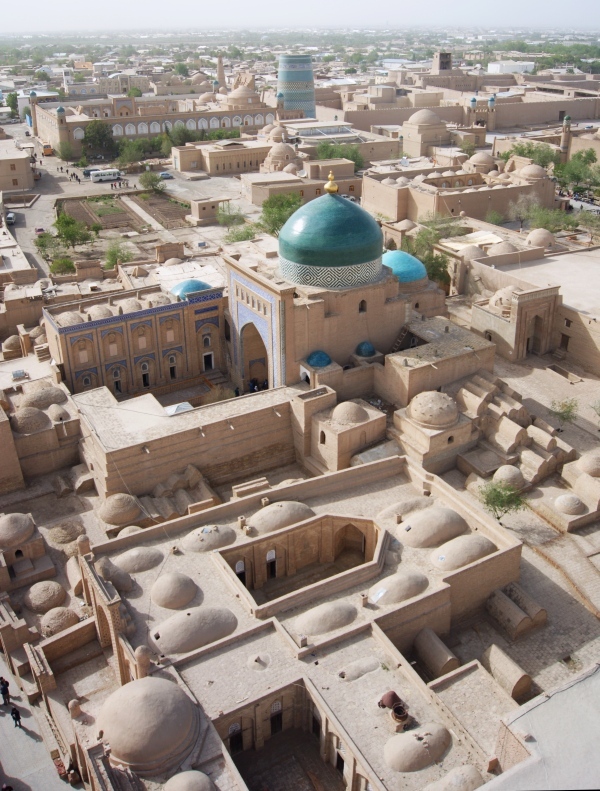 There are arguably other stunning cities in Uzbekistan, but here you can see in one city the genius of the Muslim scholars during the Islamic Golden Age from the 12 c to 19 c: Architecture of squares, like the Registan Square, of Madrasas, of astronomical observatory, litterature, technical books. The construction of monumental buildings was seen as a matter of prestige, emphasizing the power of the ruling dynasty, leading families and higher clergy. Alexander the Great went up to Samarkand and conquered it. Samarkand region is also the birthplace of the most famous leader in Central Asia, Tamerlane, aka Timur, who was born in Shahrisabz, south of Samarkand. Tamarlane ruled on one of the biggest empire that ever existed. It spreaded from Istanbul to Delhi and lasted as a strong empire from 1370 to the 1500. His descendants include the famous astronomer Ulug Bek, who was the first in the 15th c to calculate the circumference of the Earth, and Babur, who invaded Hindustan to establish the Mughal Empire, making nowadays India the third Muslim country in the world. This mausoleum keeps the Tamerlane family. A famous story is told about this mausoleum. Stalin, who knew how powerful and successful was Tamerlane as a ruler, ordered scientists to open his grave in order to find some artifacts that he could later use himself as a symbol. However, on the Tamerlane grave, there was an inscription saying: “if my grave was to be opened, the bloodiest battle would ensue”. Scientists didn’t pay attention to this and they opened the grave the 21th of June 1941. The following day, the Germans attacked the USSR. This coincidence is widely known as “the Malediction of Tamerlane”. 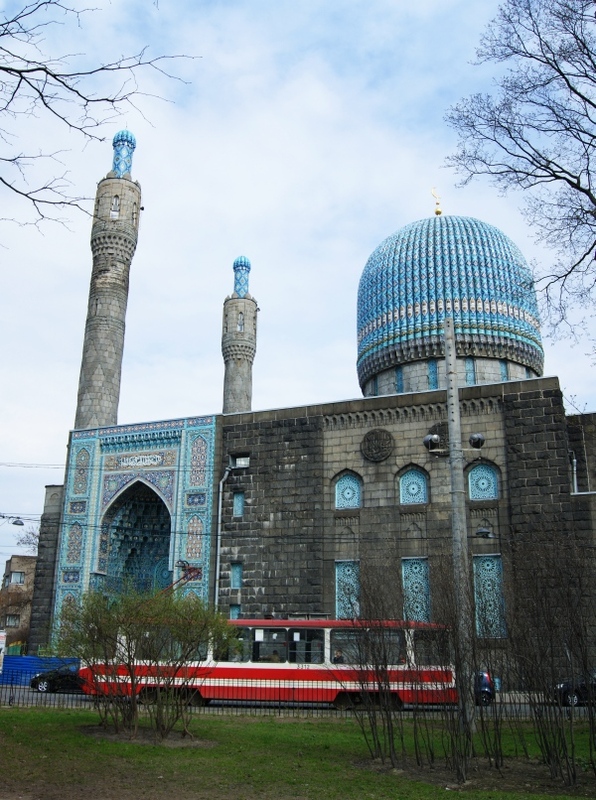 It’s interesting to know that in 1906, the Emir of Bukhara offered to the city of St Petersburg, Russia funds to build a mosque, which is almost a copy of Gur Emir. The Registan Square at Samarkand, undeniably the most beautiful square in Central Asia. If you read Russian, I can recommand a very interesting article on how Uzbekistan people interacts with foreigners, written by Andrey Fatyushchenko in 2003. Sebastian, has the charisma of writing fantastic articles. Even someone did not visit the country,out of his story will like to visit this place. I wish many writters can handle articles the way of Sebastian is doing. Always his articles are a piece of art.